I basically have a few speciality dishes that I am able to make myself from start to finish without any assistance. One I wrote about recently, and that is chicken marsala. The other happens to be various incarnations of risotto. 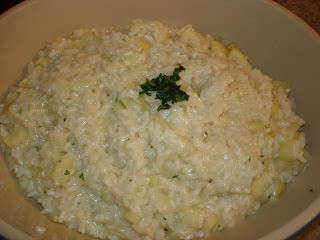 One of my favorites is a recipe I garnered from Mario Batali's Simple Italian Food cookbook, Green Apple Risotto. For this recipe, however I actually do ask my wife Sasha's help on a couple of preparatory items. The first is chopping an onion, which she is quite skilled at and saves me the trouble of having my eyes become watery. The second is peeling and slicing the apples. Ever since I accidentally peeled some of my finger while peeling a small papaya, my wife has been in charge of peeling round fruits or vegetables in our house. The only thing I peel now is cucumbers. At any rate, the first step is to heat the butter & oil in a caserole dish at medium heat. Then add the chopped onions and cook until they soften but not brown for several minutes. Next add the apples and rice simultaneously and cook for 3-4 minutes. Then add the wine and mix with all the ingredients. The key once you start adding the liquid, wine in this case, and later the chicken stock, is to make sure there is always some liquid mixed with the rice and other ingredients - at least until the point where the dish is ready. Another tip is to stir with some frequency throughout the process. This way the rice will not stick to the bottom of the dish, which is something you want to avoid. After a few minutes when you notice the wine has reduced, add the first cup of chicken stock and stir together with the ingredients. Continue to add the remaining chicken stock, one cup at a time at the point where the previous cup has reduced in half. The entire cup adding process & stirring should take about 20-25 minutes. After the last cup of stock has been added and just about fully reduced, you can add in the parmigiano-reggiano cheese, parsley, salt & pepper and mix together fully. Then you are ready to dispatch from the caserole dish into a serving dish for your meal. If you would like to check out another risotto recipe on this website, check out Sasha's Triple Mushroom Risotto, or Eric's Mussels Risotto. I think your tip about adding broth "one cup at a time at the point where the previous cup has reduced in half" is a good one. 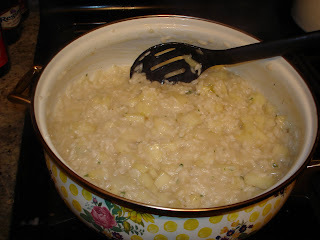 I usually wait too long and let the broth evaporate completely, resulting in risotto that lacks that smooth taste (not too cruncy or too soft). Thanks.